Hi and a "Happy new year" to everyone when it happens. I've acquired this escutcheon and the text is a bit worn on places, does anyone recognise it as a Chubb escutcheon? I think I may have seen it before on fleabay listed as a Chubb escutcheon but my memory stopped serving me well many moons ago so help would be greatly appreciated. I'll bow down to your expertise Oldlock. I look at so many plaques and escutcheons that I sort of confused myself. Plus with the top half of the stamped coat of arms missing I was blind guessing. I had not came across a star shaped safe escutcheon until about a month ago on fleabay when I noticed one selling among an auction lot including several other escutcheons and safe plaques. Needless to say I didn't win that one as it went above my best bid so I was quite pleased when this one turned up last week. Hopefully someone may recognise it and solve my mystery. I think it's from a no-name third tier victorian maker with spurious markings. For the markings to have been 'right' for Chubb it would have been pre-1830 or thereabouts with a large direct throw iron door lock with a much bigger key. It never even occurred to me that key size could/would be a way to rule Chubb out. I've tried my early Chubb safe keys out of curiosity rather than unbelief and your certainly right Oldlock. That's the difference between a professional and a collector, collectors hope they have something special whereas professionals know when they have something special. Thanks once again. 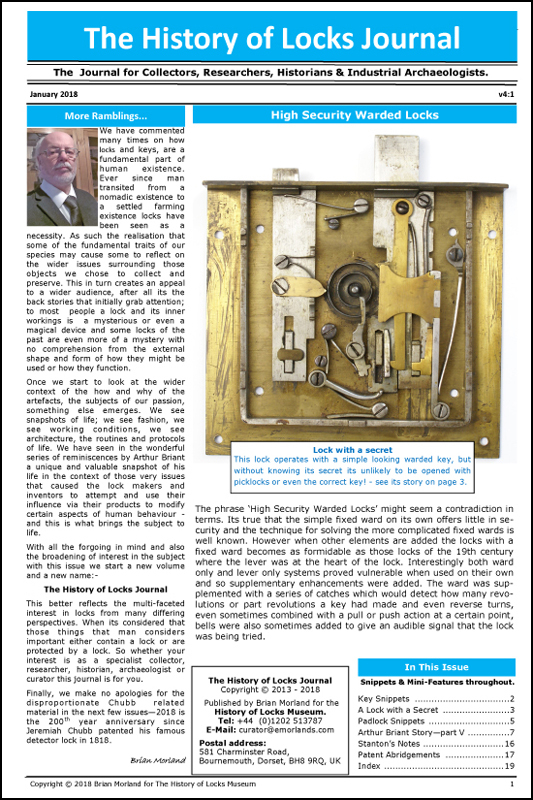 Remember also, how Mr Chubb railed against unscrupulous 19C safemakers who bought-in unsuitable genuine Chubb locks (usually cabinet locks, as Chubb did not sell safe locks to any other maker) so they could truthfully mark their safe (a 'jewelled gew-gaw', as Mr Chubb described them) "Chubb Lock".
. So this is not a genuine Chubb safe and only has an inferior chubb lock that Chubb would not put on one of their own branded safes? Correct - usually a drawer lock; and in those days, likely fitted to shoot upwards. Curiously, there are a couple of those coat of arms badges on Ebay currently. Do they look pre-1837? not that I am a heraldic expert.